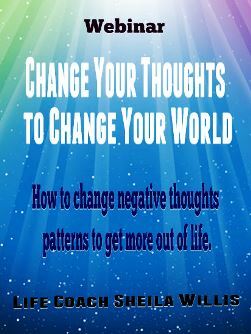 Discover how we create our own reality by the thoughts we think.... and, how you can improve your quality of life by changing your thoughts. If, you're wanting to make positive changes in your life this webinar is for you. *Discover how you can have more abundance. *Discover how to have more success. *Discover how to have more financial freedom. Video: duration 2.5 hours Instant download. "Michellene Tipton, "The seminar was wonderful. So informative. And I must say, "mind blowing" at times. I thank you." Earl D Foster, "Yesterday evening I attended a webinar for Live Your Happy I didn't know what to expect but I was amazed at what I heard. Not only were sound principles and timely wisdom presented, but the root of issues I had been dealing with for many years came to light and I finally saw clearly how to put them away for good. With all the sincerity I can express I tell you this webinar can change your life. If you're ready to live your best life now, seek to attend the next event presented by Sheila Willis. Thank you, Sheila!" Latesha Tubbs, "I'm excited to put into practice the tools given on last night. Sheila is excellent in presenting truth!" Tonia Reeves, "Everything she said lifted tons off my chest. Thank You Shelia, you are a phenomenal woman. You have no idea how you blessed me." Are you interested in changing the course of your life? If you are looking to make positive changes in life and to create your desired then get this video.